I can only imagine that you are desperate for news of my walking challenge. Well, there is news. BIG news. News of a round number. A LARGE round number. There have been ups and downs, three weeks of failing to make the distance for starters, but there have also been huge successes. One of these was last week, when on holiday I very nearly doubled my distance. This has ensured that whilst there might be bad weeks, that my average daily healthy mileage is above five. If I can keep that up I'll meet the annual goal at least. Anyway, on to the momentous figure - 300 miles. Surpassed at some point this morning whilst walking up and down the garden cleaning up after storm Doris. There wasn't much to do - a few big sticks to tidy away, and the re-erection of all my bird feeders, all of which came down. No damage done, but at some point between Thursday and today the local foxes have decided that what the feeders really needed was to be decorated with poo. Why? The bird feeders had no territorial ambitions, they just happened to be blown onto the lawn. Thanks foxes. A nasty job, fox crap is pretty rancid at the best of times, but to be cleaning it off my bird feeders came low down of my list of things I wanted to be doing this weekend. Done now, but honestly. Yuck! So back to walking, and another victory for foot power. Tony found a Med Gull on Wanstead Flats this morning, a decent bird over here. I trekked out to try and find it a little later, averting my eyes at the increasingly wanton destruction wrought by the Corporation of London. 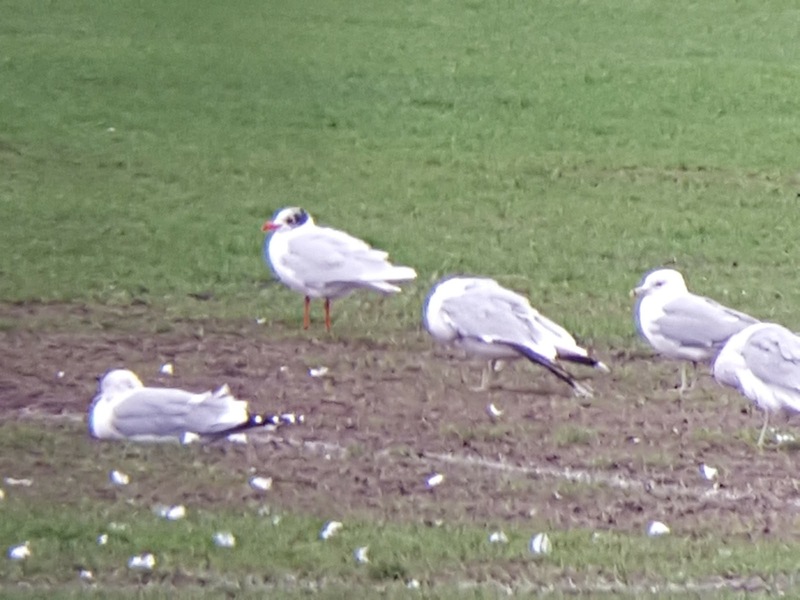 Scanned far more Gulls than is healthy but couldn't find it. Hey ho. 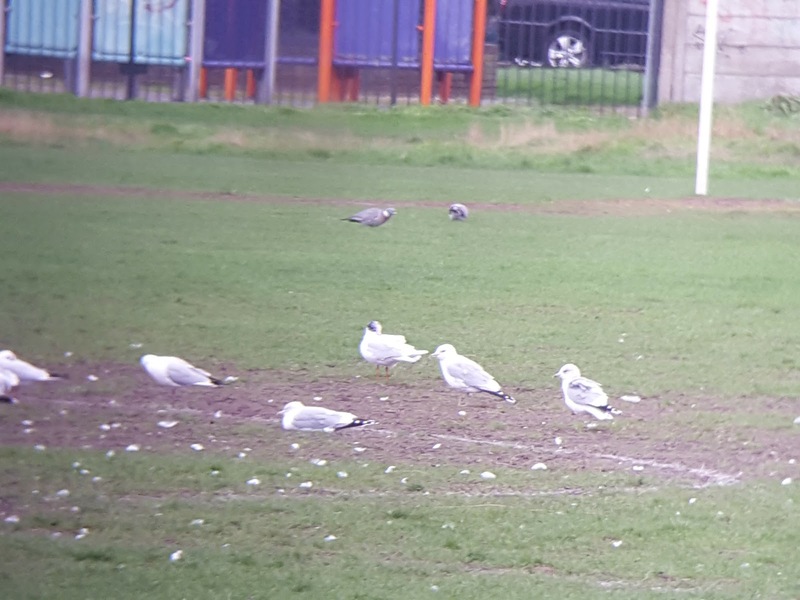 Bob, Tony and I converged on the playing fields having collectively looked through nearly every group of Gulls on Wanstead Flats, and as is entirely normal for 9.30am started talking about Gin and Tonic instead. It's the demographic I think. Anyway, I had actually gone out this morning with the intention of buying bread in Leytonstone before being diverted in the opposite direction by larid news, so after a healthy discussion on when the first snifter of the day might occur, I bade farewell to the guys and started to head back. So here it is, most lovely. This er "image" was actually taken with my phone through one barrel of my bins, which I didn't think was likely to work but has somehow produced an identifiable record shot. I did eventually make it to the bakery, and £3.80 later was the proud owner of a sourdough loaf made with 30% rye. Fantastic. I also found a new fishmongers, so dinner at Chateau L this evening involves fresh shrimp and Red Snapper. I may even break out some white wine, but only after the Gin. Wasn't desperate but hope you can see the benefits of this application of will power! "Egad" deserves an extra point in a blog post! The image could be said to be "larid-able! Oh dear.